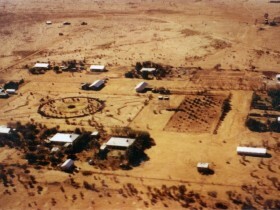 PAW Media received a NT Centenary Grant in 2011 to help celebrate 100 years of the NT's separation from South Australia. We gathered photos from our archives as well as photos kindly provided by organisations and individuals connected to Yuendumu and put them together for a community showing. The photos were a sampling from the 1930s through to the 1990s. The photos were shown to the community using our big outdoor screen as the lead up to the Yuendumu Battle of the Bands on Saturday 30 July 2011. The photos were a great hit, and have since been available on the PAW Media community access computers at the Yuendumu "Big Shop". 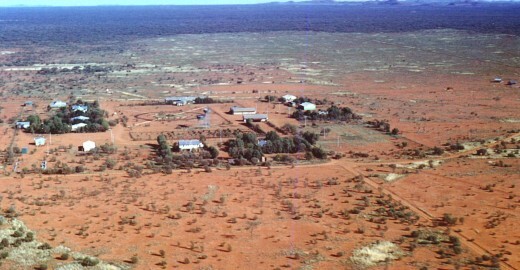 The early photos of the Yuendumu settlement showing only a few buildings were a surprise to newcomers to Yuendumu. 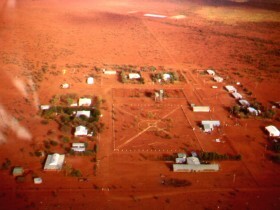 Yuendumu nowadays is a (for a remote community) a large community with numerous public buildings and dozens of houses. Lots of stories were told between people on the night about the history of Yuendumu as well as the characters shown in the photos. Here is a selection of the photos shown to mark the NT Centenary in Yuendumu.